Celebrate that big day the right way with help from The Cupcake Desire. Our birthday cupcakes are a fun twist on the standard party desserts, giving you something new to enjoy. Whether the birthday boy or girl is turning 8 or 80, they’re sure to love the range of flavours and designs available from our bakery. It’s never been easier to throw a party that everyone will remember for ages to come when you choose to get your treats from The Cupcake Desire. 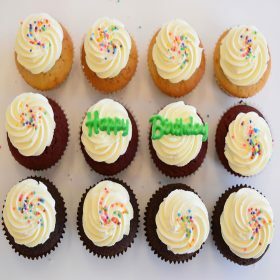 Our birthday cupcakes make it easy and affordable to feed even the largest parties, letting you mix and match different flavours to ensure that everyone – regardless of preference of dietary restrictions – can find something delicious to enjoy. Take a look at our range of standard and deluxe flavours and discover something perfect for your party. Every sweet baked by The Cupcake Desire is made using only the very best ingredients and by the most skilled and passionate chefs. We know what goes into a good cupcake – a novel idea, the right amount of icing, perfectly moist texture and perfectly balanced flavour all combining into a phenomenal sweet treat sure to impress even the pickiest eaters. Choose something that’s guaranteed to be a hit and give everyone the chance to find their own favourite flavour with our birthday cupcakes. Perfectly sized for single-servings, they’ll be a hit with guests of all ages. With delivery available five days a week, have our birthday cupcakes delivered straight to the party for the ultimate dessert experience. Whether you’re nearby in Dandenong, Eastland, Ringwood or across the city, we want to be a part of your special day. Looking for something out of the ordinary than a birthday cake? Throw a cupcake decorating party for your child and their friends and give them a day to remember. Place your order today through our website, or get in touch with any questions on 03 9705 005, or send us a message through our contact form or via email at info@thecupcakedesire.com.au.